The 68 metre FeadshipArchimedes has departed her home yard after completing a three-month refit. 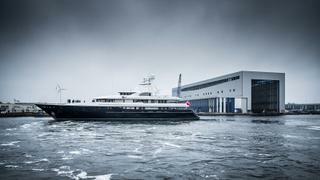 The yacht arrived at the Dutch yard in September, fresh from completing an “epic” Arctic expedition. Refit work included the replacing and upgrading of all AV facilities, fresh teak applied to the stern platform and new upholstery for the furniture and beds. The crew mess was completely rebuilt and the sun deck interior floor repainted. Major maintenance work was also carried out on the shaft line, engine supports, gangway and stern platform door. The superstructure was repainted and a new antifouling system added too. Her refit was well deserved. Since her launch in 2008, Archimedes has visited more than 80 countries and clocked up over 210,000 nautical miles. Captain Christopher Walsh said the yacht had been returned to "perfect condition" and is ready for "the owner and his guests to embark on another decade of exploring the oceans". "Our recent expedition into the high Arctic has certainly whetted everyone's appetites for more adventures," he said. He added that bringing Archimedes' to her home yard for the three month refit had been a "pleasure." "The project was finished on time and on budget," he said. "The three months we've spent here brought back great memories of the original build back in the mid-noughties."